As a rule, Vicar Humbly did not believe in premonitions. He was a sensible man who did not seek ominous omens or hope for miraculous messages from above. Such flamboyant symbols did not suit a simple vicar. But this morning he could not deny a vague sense of unease. Three letters. All delivered in this morning’s post. Three letters from three separate brides, all of whom had haunted his conscience for the past several months. Could it be a sign? With a frown, he tapped a finger upon his cluttered desk. On first glance, there was nothing in any of the letters to stir his concern. They contained nothing more than mundane details of the young ladies’ days, local gossip, and a hope that he was doing well. But the mere fact that he had often worried over the fates of Addy, Beatrice, and Victoria made him sensitive to the realization that none of them revealed the giddy happiness that surely should be apparent in the letters from a new bride. Indeed, they were oddly stilted as if each were afraid of revealing too much in their guarded words. His notoriously soft heart clenched at the thought that they were in any way unhappy. Perhaps he should not have ignored the doubts that had plagued him before he had agreed to perform the weddings. Although the marriages had been months apart, he could not deny that each had made him hesitate. Deep inside there had been a decided fear that all was not well with the three couples. 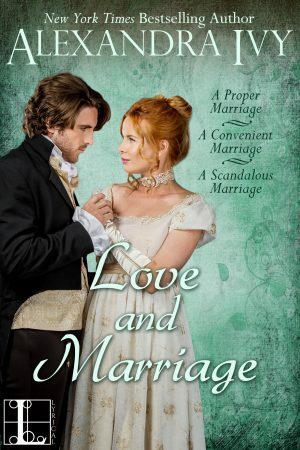 Poor Addy Morrow being wed to Mr. Drake who deeply disapproved of her vivid spirit. Beatrice Chaswell who Humbly feared was being wed for her large fortune. And Victoria Mallory who had been unexpectedly compromised and forced into marriage with a complete stranger. Three marriages that had been chosen for reasons other than love. Hoping to clear his muddled thoughts, Humbly left his desk and slipped through the open door to the garden beyond. There were few things more delightful than Surrey in April, he decided as he carefully bent down to weed around his beloved roses. Rare sunlight dappled the countryside, warming the soft breeze that was liberally laced with the scent of wild flowers. Butterflies danced in twirling patterns, while newborn foals awkwardly stretched their legs in a nearby pasture. Even the distinctly shabby Vicarage with its worn red bricks and slate roof acquired a mellow beauty in the golden glow. It was a day to appreciate one’s blessings, Humbly tried to tell himself. And he had a great deal to appreciate. A rich, full life in service of God. Remarkable health for a gentleman staring sixty directly directly in the eye. And dear friends that often filled the Vicarage. And, of course, he would soon be leaving his duties to retire to a lovely cottage only a few miles away. At long last he would have ample time to devote to his garden and the freedom to indulge his fancy for titillating novels that he had always adored, but that had never seemed quite proper for a Vicar to read. Yes, he should be in a joyous mood, he acknowledged with a faint sigh. But instead he found his thoughts dwelling upon those disturbing letters. Could he truly retire in peace with the knowledge that three of the marriages he had blessed were in trouble? Did he not have a duty to assure himself that he had done all that was possible to help those in his care? He heaved yet another sigh as a shadow fell over him. Glancing up, Humbly regarded the iron gray hair and forbidding expression of the stout woman who towered over him. Mrs. Stalwart had been the housekeeper at the Vicarage for the past thirty years. Like a seasoned general she kept his household running with a smooth perfection, turned aside those who would take advantage of his soft heart, and ensured that he was kept somewhat in order. Not a day passed that he did not send up a small prayer of thanks for God’s good sense in bringing Mrs. Stalwart to his life. Even if she did tend to scold him as if he were six rather than sixty. As if to prove his point, the housekeeper placed her hands upon her ample hips and glared down at his rumpled form. Humbly shuddered in horror. Mrs. Stalwart might be the very best of housekeepers, but she had no love for his precious books. Given the opportunity she would no doubt pitch the lot of them in the nearest fire. Ignoring the protest of his knees, Humbly rose to his feet. It was difficult to possess a measure of dignity while a large woman hovered over him.